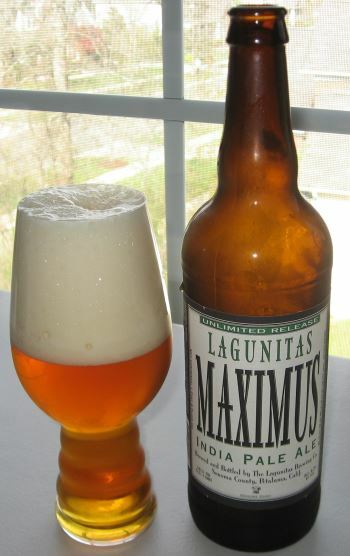 Maximus by Lagunitas is, as they say, “a bigger, badder version of our favorite style.” That means a super-hoppy IPA, and it’s really more of an Imperial IPA. It’s west-coast-ish, but there isn’t a ton of pine…Just a bit in the finish. The head is sticky and heavy, and dissipates moderately quickly. The nose has grapefruit and honeysuckle. The middle has big sweet grapefruit and orange notes, fighting some bitter burnt toast and herbs. The finish has the aforementioned bit of pine and more sweet orange. The sweet and bitter notes in this beer aren’t so much balanced as they are both simply strongly present. The flavors are all fine and nice, but the strength of the different flavors, and their lack of cohesion means that this isn’t going to be a session beer. 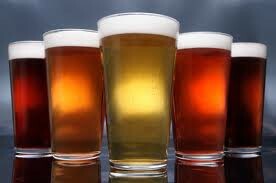 Not that the the alcohol level (8.2% ABV) would allow it to be a session beer in any case. I like it, but I don’t love it. I give it 3.9 out of 5. This entry was posted in Reviews and tagged American IPA, California, DIPA, Imperial IPA, IPA, Lagunitas on April 8, 2014 by Xander. 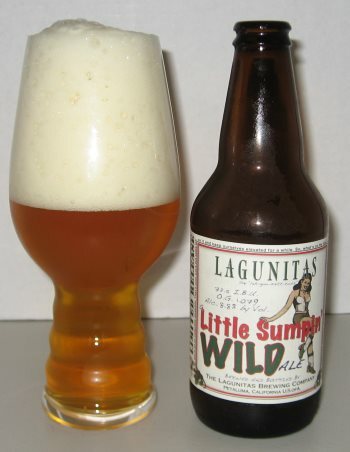 Since my last review was of Lagunitas’ A Little Sumptin’ Sumptin’ Ale, it’s only fair that this review is of her limited release big sister: A Little Sumptin’ Wild Ale. This is like an Imperial Belgian Wheat IPA, if that makes any sense. Wheat malt, Trappist yeast (for the Belgian flavors) and massively malted and hopped for big bitter flavor and a relatively big 8.8% ABV. The big hops mean that the mildness of the wheat malt is fairly well overpowered and lost. There’s some sugary undertones in the middle that taste a bit like rice, and I think those may be all that’s left of the wheat in this brew. Other than that, this is a nice solid double IPA. A has a lot of orange, some pine, and the aforementioned sugar. The Belgian yeast also gives it a bit of apricot in the middle, and a nice ripe fruity nose. A very good beer. This entry was posted in Reviews and tagged Belgian IPA, California, DIPA, Imperial IPA, IPA, Lagunitas on September 13, 2013 by Xander. Little Sumptin’ Sumptin’ is another fun wheat ale, this time, a west-coats IPA-ish version of a wheat beer. The mild wheat base is loaded with hops that give it plenty of orange and pine in the nose, grapefruit and loads of pine in the middle, and orange in the finish. The result is a mildly bitter ale with all of the characteristics of a west-coast style IPA in a lighter, easier to handle form. It’s super cool, and given that the west-coast IPA is one of my favorite styles, I love this twist. 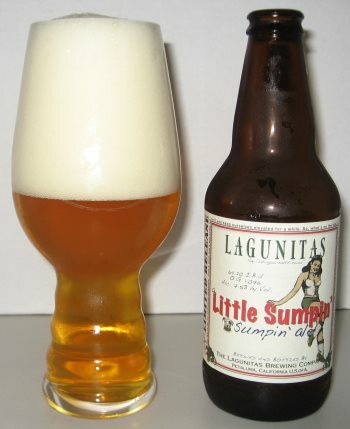 This entry was posted in Reviews and tagged California, IPA, Lagunitas, Wheat Ale on September 11, 2013 by Xander. 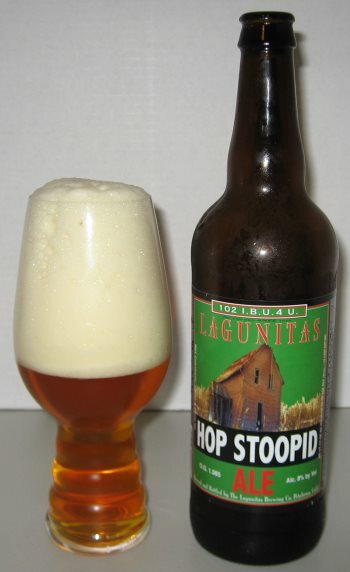 Tonight I’m enjoying Hop Stoopid, an American Imperial IPA from the Lagunitas Brewing Company and I’m enjoying it in one of my new Dogfish Head (lightly) branded Spiegelau IPA glasses, which I love. It proclaims on the bottle “102 I.B.U. 4 U.” and they ain’t lyin’. The nose is grassy, and piney, and a little citrusy with some pineapple notes to boot. The middle is a heavy hop bomb of the bitter, west-coast style that I so dearly love. The body lives up to the imperial billing, as this is a medium to heavy weight beer. There is tons of citrus, primarily grapefruit and orange, with loads of bitter rind in the forefront, fading to some sweet orange sugars in the finish. I also taste a touch of vanilla throughout, mellowing it a bit. The alcohol in this beer is a healthy, but not huge 8.0% ABV, and it really stays in the background pretty nicely. This is a really outstanding, complex beer, and a unique twist on the super hoppy west coast IPA style. This entry was posted in Reviews and tagged California, DIPA, Double IPA, Imperial IPA, IPA, Lagunitas on August 6, 2013 by Xander.